If you’ve heard of Louise L. Hay, author of the highly acclaimed best seller You Can Heal Your Life, then you already know what she’s all about, personal empowerment. To Inner Pieces Gallery it makes perfect sense that she also created a number of children’s books. 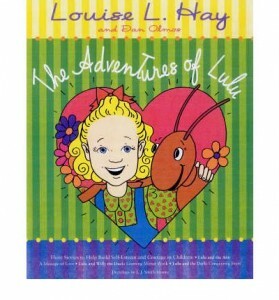 The Adventures of Lulu, written by Louise L. Hay and Dan Olmos, is one such book. This compilation of children’s stories originally began as coloring books and audio books. Now they are compiled into one illustrated children’s book. The intention? To empower children. Each of the three stories in The Adventures of Lulu are approximately thirty pages long, perfect for bed time reading. In true Louise Hay fashion they offer powerful life lessons, affirmations that show up as songs, and spirited characters that make the lessons easily relatable. I was impressed by how well the authors tackled a common childhood fear, fear of the dark. The frightening experience was so well described that I even heard my inner child cheering “Yes! Yes! That’s exactly how I felt!” Lulu and I were instantly connected. And when her doll appeared in Lulu’s dream as a life sized friend, well, the little girl in me was hooked. As parents, it’s important that we instill in our children a sense of independence, power, and the knowledge that they can make a difference in the outcome of today’s world. As you build your arsenal of enrichment and empowerment tools, The Adventures of Lulu will help you do just that.